After an international career in marketing, Gayé Delahousse moved into entrepreneurship with the creation of Ski Guru, the first price comparison platform for ski resorts based on customer reviews. Here is the portrait of an exciting entrepreneur, at the head of a fast-growing start-up. “The mountains make you feel very small,” says Gayé Delahousse. Based at Le Bourget du Lac, with her company Ski Guru, she can admire the snowcapped peaks that have inspired her and where she has been skiing for over 10 years. But her career began far from the Alps and in Turkey, where she comes from. Her family took her skiing in Europe from a very early age and passed on to her the joys of skiing. She didn’t make skiing into her profession straight away; instead she began with marketing and psychology studies and jobs with international companies: Ogilvy, Hasbro and the Seb Group. “I was a group leader in Turkey and I had the opportunity to be expatriated to Rumilly in France, which is quite exceptional,” says Gayé Delahousse. That’s how she started getting involved with the snowcapped peaks. First on a personal level, for it was in Haute-Savoie that Gayé Delahousse met her husband. He was working in the mountains and the couple decided to settle in the ski resort of La Plagne. Then professionally. Gayé left the Seb Group for the Compagnie des Alpes where she handled marketing for Paradiski, and then took over marketing and sales management for Val-d'Isère. The missions and projects were exciting, and they were always changing. Throughout this long experience, this marketing professional felt the need to train, take stock of her skills and expand her professional network. “I also wanted to have a high-level French qualification in keeping with the good schools I had in Turkey,” she explains. 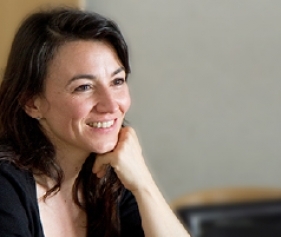 She chose emlyon business school and its Executive MBA. With modules such as finance, strategy and personal development, the course fully met her expectations and opened the door to entrepreneurship. “The courses were important and useful, but I also really enjoyed the group I was in. Like me, the participants were 40 years old on average and had similar questions. I learned a lot from my peers,” she adds. During the two years of the EMBA, she fine-tuned her know-how, changed the way she worked in favour of even more participative management and became more involved in Compagnie des Alpes committees. It was while she was developing a mobile application for Val-d'Isère that her business project was born. “I became interested in creating a site with customer reviews of holiday destinations, like ski resorts. I talked to Trip Advisor about it, but they weren’t interested. So I thought ‘there’s something to be done here’, and that’s how Ski Guru got started,” she explains. The project began in 2017 with the creation of this ski resort price comparison platform www.ski-guru.com, based on customer reviews. “In Compagnie des Alpes, I also noticed that the resorts were not very clear about customer reviews. What you find on social networks is only for captive users. Which was a problem if you want to be ‘customer-centric’”, adds Gayé Delahousse. The business model is based on partner stations having access to customer information and the opportunity to communicate with them. Internet users and professionals also have the guarantee that the opinions submitted via the partnership are truthful. As a sign that her project was meeting a need, over 5,000 customer reviews were collected in the first season. And 80 ski resorts are referenced. Ski Guru has also won two awards: the Trophée de la Montagne Française, an Economy award, and the Digital Mountain Awards for the best B2B start-up. Now a company director, Gayé Delahousse is discovering a new way of working, very different from big groups but just as fulfilling. And she makes use of her network and what she learned at emlyon business school on a daily basis. 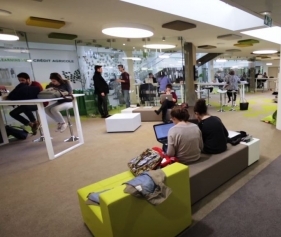 “In order not to feel I was on my own, I decided to anticipate and joined the Village by Crédit Agricole accelerator. I am also a member of the Cercle des Jeunes Dirigeants (Young Leaders Circle), which helps me to interact with other business leaders and to keep in touch with others. And I’m taking another look at my course notes to help me get through the different stages of entrepreneurship. My life is not as calm as it used to be. There are lots of joyful moments and also quite a lot of anxiety. I go from surprise to surprise, and that’s what I wanted,” says Gayé Delahousse. She has big ambitions: she wants Ski Guru to go international and reference European ski resorts. She’s thinking of a “summer” version and possibly other leisure destinations. All these ideas will help her to reach the heights very quickly! The emlyon business school Executive MBA is the ally of those who want to see their career take off. Move up within your company, earn more, and delve into entrepreneurship ... 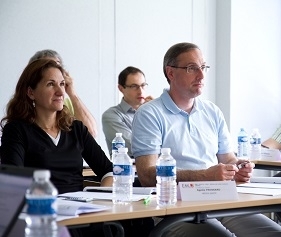 Following the emlyon business school Executive MBA guarantees meaningful professional development. The program was ranked 5th in the world for career progression by the Financial Times in 2018. 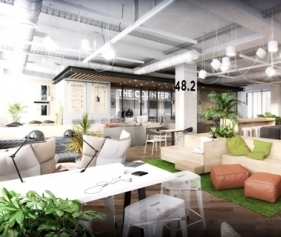 As a fast-track or part-time course, it is aimed at “makers”: experienced managers and executives who are leading a project or seeking to challenge themselves by acquiring new skills around today’s business challenges. The Executive MBA explores finance, strategy, decision-making, management, data, personal development and innovation.